An exquisitely preserved fossil found in China still contains the original biological compounds that gave a 130-million-year-old bird its shading and color. The find extends the timeframe in which scientists thought these substances can be preserved. In a new paper published in the Proceedings of the National Academy of Sciences, researchers from North Carolina State University, the Chinese Academy of Sciences, and Linyi University, show evidence of original keratin and melanosome preservation in the fossilized remains of Eoconfuciusornis, a crow-sized bird that lived in China some 130 million years ago. It’s the oldest fossil ever discovered to still contain traces of these color-giving molecules. Paleontologists have discovered traces of pigment-containing organelles called melanosomes on fossilized feathers before. Trouble is, scientists weren’t sure if the melanosomes, and their associated color, were actually from the preserved creature, or from microbes that collected on the feathers during decomposition and fossilization. More evidence was needed to separate the two possibilities. Using scanning and transmission electron microscopes, along with a technique to create a high resolution map of the elements within the feathers, the researchers were able to show that the chemical traces of both melanosomes and keratin in the fossil were indeed derived from the original feathers, and that there was no mixing or leaching during decomposition. 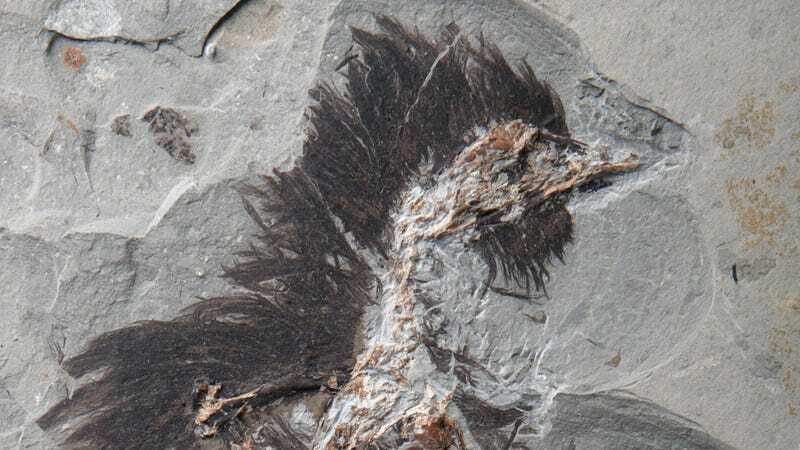 The dark brown shading seen on this fossil is reasonably indicative of how it appeared on the bird when it was still alive. The researchers say their new technique has the potential to help scientists understand—on the molecular level—how and why feathers evolved in these early birds. Excitingly, the presence of melanosomes and keratin in a fossil suggests that other fossils could reveal similar secrets. It just so happens that virtually all dinosaurs had feathers (whether Jurassic Park chooses to admit that or not), so it’s conceivable that the new technique could be used to determine the color schemes of certain dinosaurs. That assumes, of course, that palaeontologists can find a fossil as beautifully preserved as this latest one.